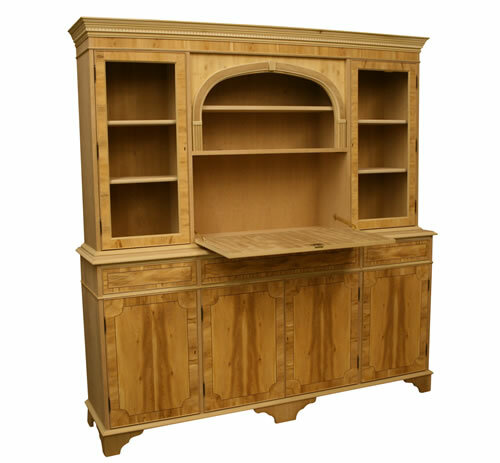 As a manufacturer of quality English reproduction furniture, we have the facilities to offer bespoke furniture to our customers. We are able to work to your own designs and veneers. 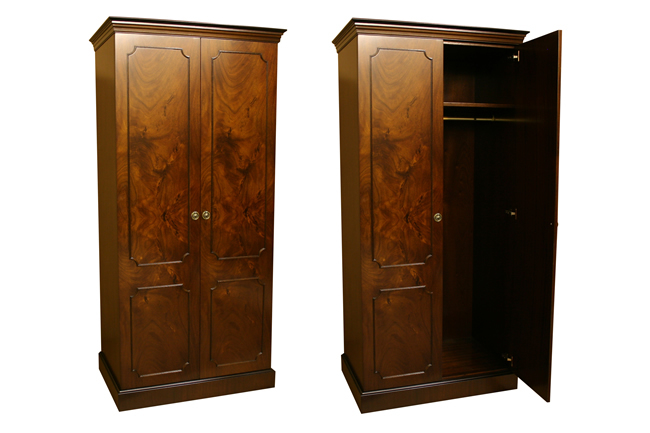 In house we have the facilities to offer a full range of cabinets, you can see below some examples of pieces we have made to our customers own specifications. 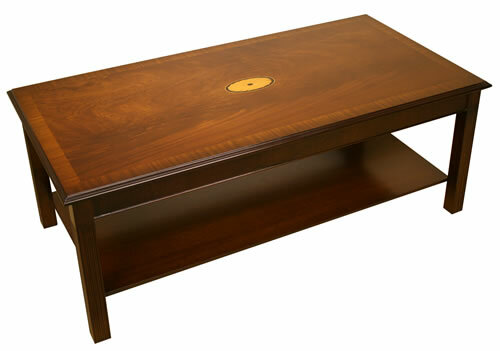 This coffee table was made using a curl mahogany veneered top with cross banded edging and a fan marquetry inlay. The legs have been reeded and there is a bottom shelf below. This is a stunning item that has been manufactured in many sizes including large square versions. 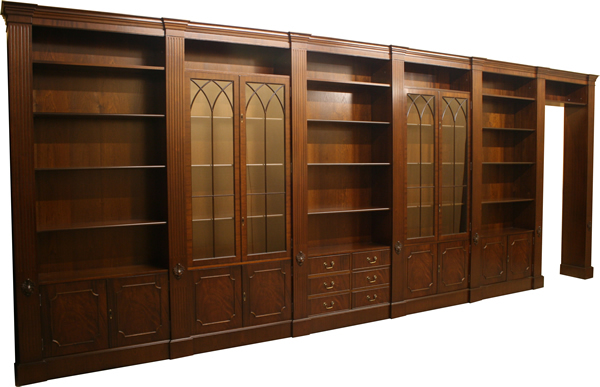 The above modular bookcases were manufactured in Mahogany finish with reeded columns between the bookcase units. On the right hand side you will see that there is a bridging unit that joins to an end column. This provided a walkway as the unit was made to sit over a door. We have made many versions of these bespoke modular bookcases over the years in a wide range of wood finishes including Burr Elm, Yew, Cherry and Poplar. 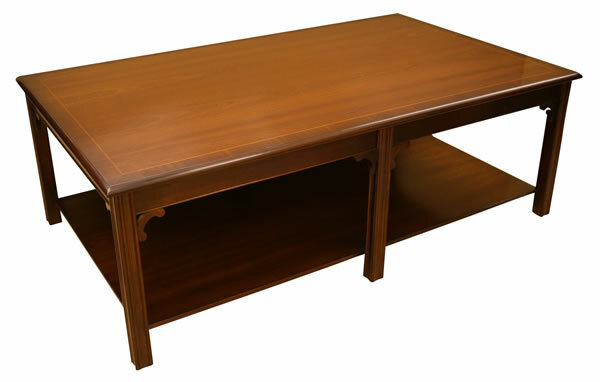 The above L-Shaped Desk was made in an Oak veneer. These are popular desks based on the concept of a desk and workstation return but adjusted slightly so that the desk top is the same height as the return to give an L-Shaped working area. Many of these desks are also made with modesty panels that go down to the floor. 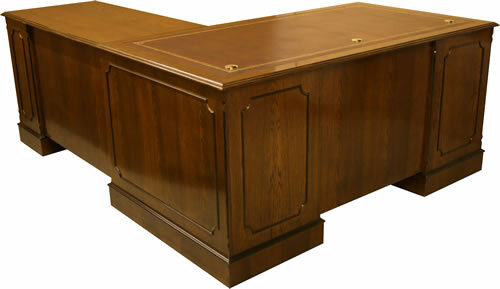 This bespoke desk was manufactured in Antique Mahogany with an angled end to the customers own specific design. Internally there was holes cut for the wiring to run up to the brass monitor plates on the desk top. 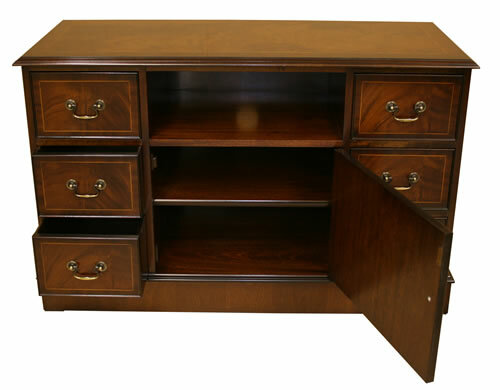 This bespoke television cabinet has been produced in Mahogany finish with 6 drawers and a cupboard. The unit has our standard white line inlays with cross banded edging on the top. This bespoke television cabinet has been produced in Yew finish to a very narrow depth as requested by our customer. The unit has our standard black line inlays with cross banded edging on the top and front. This bespoke glazed reproduction bookcase in Yew finish has been manufactured without drawers and a bevelled glass top to the bespoke sizes of our customer. 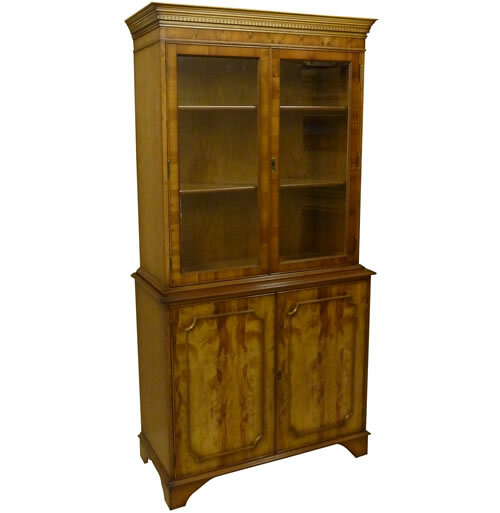 The bespoke reproduction television cabinet above was made 180cm wide in Antique Mahogany finish. Each of the 4 cupboard sections have a fully adjustable shelf behind with 2 working drawers in the centre sections. The above bespoke coffee table was made with 6 legs and a fitted shelf to the exact requirements of our customers design. 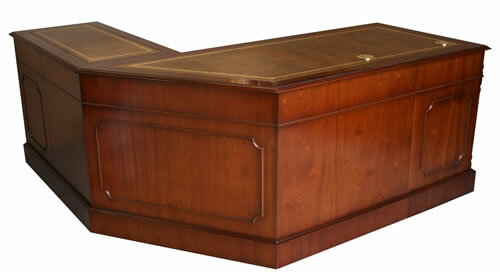 This piece was mahogany finish with a white line inlay on top and cross banded edging. 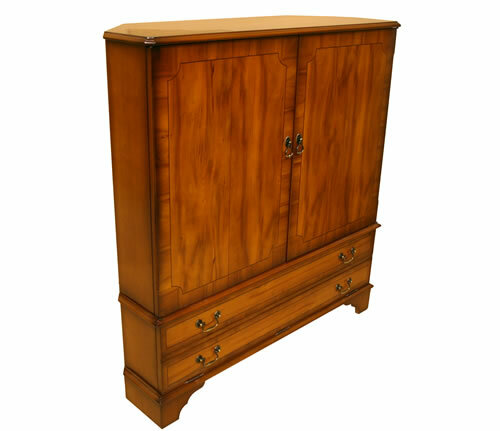 The above wardrobes were based on a customers own sketch and dimensions and were produced using beautiful curl mahogany veneers with astrgial mouldings on the doors and antique ring handles.